Color advertisement featuring all the main characters. Fleischer Family Collection. Large lobby card. 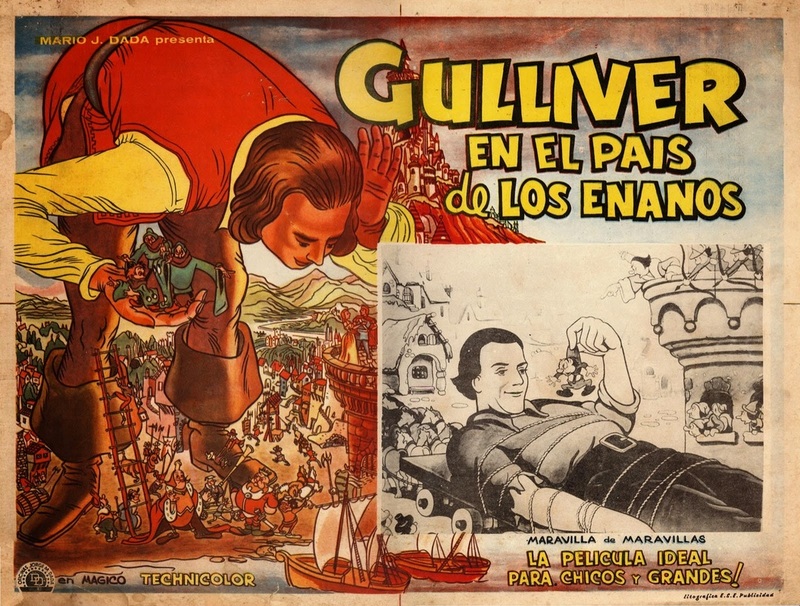 Gulliver Travels was also a huge success overseas and in many Spanish speaking countries. Fleischer Family Collection. Rainger and Robin’s ‘Faithful Forever’ helps Lilliput avoid war by combining the two songs, Faithful’ and ‘Forever’. Fleischer Family Collection. Gulliver working script with notations by head animator Tom Johnson. Fleischer Family Collection. 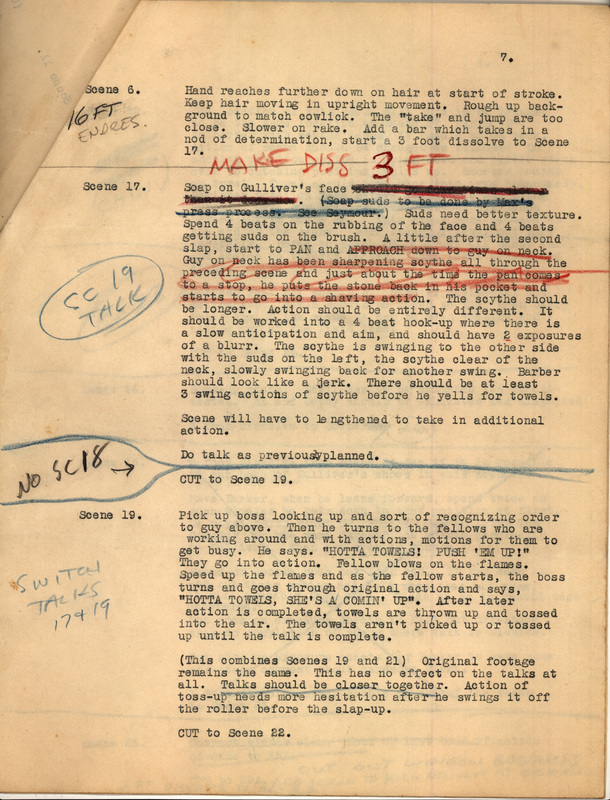 Working script for portion of Sequence 8 with markings for clean-up corrections by Tom Johnson, dated July 9, 1939. Fleischer Family Collection. 8” x 10” black and white lobby card, dated 1939. Fleischer Family Collection. Animation cell showing ‘Snoop,’ one of the spies who worked for King Bombo. Fleischer Family Collection. Animators used model sheets for all the characters in order to achieve a consistent look. This sheet is for the character ‘Twinkletoes.’ Fleischer Family Collection. 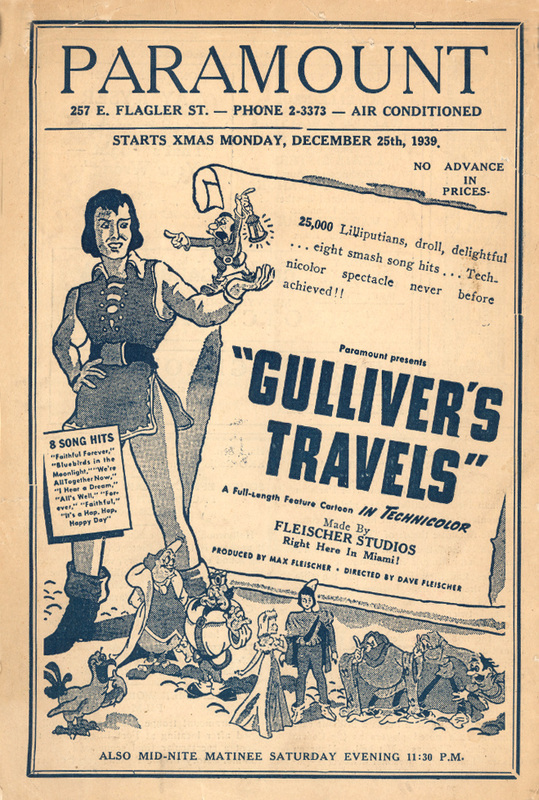 Seventy-five years ago, in December 1939, Gulliver’s Travels opened to great fanfare in theaters in Miami and New York. The crowd in Miami was so large that it filled both the Sheridan and Colony Theaters, while in New York, Gulliver’s Travels broke box office records in its first two weeks at the 3,664-seat Paramount Theater. Little did those early viewers know that the story behind this now-classic film was itself an amazing story. It’s the tale of a truly remarkable journey: one that spanned more than 1,200 miles, involved the work of 678 artists who created 665,280 drawings using 16 tons of paper, 49,000 pencils and 12 tons of paint on a half million cells; and all while struggling to meet a seemingly impossible deadline. The Fleischers had long hoped they would make the very first full-length animated feature. However Paramount, their distributor, didn’t think it was practical -- at least up until early 1938. That was when Disney Studios released Snow White and the Seven Dwarfs, scoring a huge hit for Disney and capturing the mantel of first full-length animated feature. Paramount, now inspired, jumped on the bandwagon and the Fleischers were finally given the green light to embark on what, for them, was a long-awaited opportunity. If they couldn’t make the first full-length animated feature film, they were determined to at least make the second one. Original theatrical Trailer for Gulliver’s Travels. But there was a catch and it was a huge one. They would only have 18 months to complete the entire project! It had taken Disney four years to make Snow White, and the Fleischers wouldn’t have anywhere near that kind of time. To make things more difficult still, Disney had already started work on its next animated feature, Pinocchio, which was scheduled for released early in 1940. Paramount set December 1939 as Gulliver's release date. Suddenly, with a staff of just 200 - most of whom were already fully engaged in completing work on other commitments - the Fleischers had to develop, write, animate and film their first ever full-length feature film. 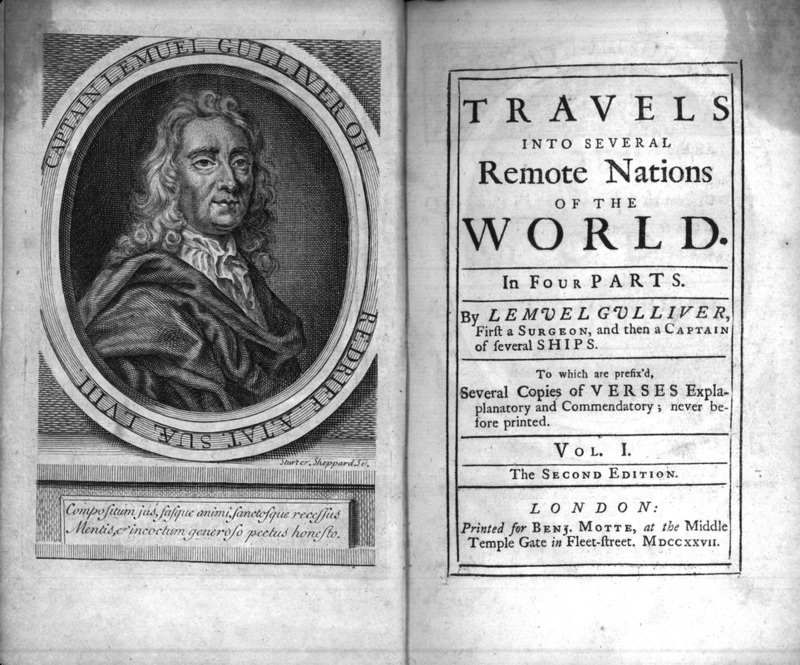 With Europe on the verge of what would soon become World War II, Jonathan Swift’s 1726 novel Gulliver’s Travels seemed an especially appropriate choice. A denunciation of war and a cautionary tale about the vices and follies of mankind, the book follows its hero, Gulliver, as he travels through bizarre lands where he encounters even more bizarre people. In his book Out of the Inkwell, Max’s son Richard Fleischer recalls Gulliver’s Travels being his father’s favorite book, one that “he used to read to me as a bedtime story when I was a child." Max Fleischer’s personal copy of Jonathan Swift’s Gulliver’s Travels. Fleischer Family Collection. Swift’s journey through magical lands also had the added advantage of having been written as a satire. This offered the Fleischer Studios writers the opportunity to craft a film that - unlike many of their previous short films, which were geared primarily toward adults - would appeal to adults and children alike. With Gulliver’s Travels selected as the inspiration for their full-length animated film, Fleischer staff set to work adapting Swift’s story. They chose to focus on the first of the book’s four parts: Part 1: A Voyage to Lilliput in which Gulliver is shipwrecked and taken prisoner on an island inhabited by tiny people not quite 6” tall. In the story, Gulliver quickly becomes involved in the petty politics of the Lillputians who become embroiled in a ridiculous war with the neighboring country of Blefuscu over which end of the egg is the proper one to break first. The challenge of how to build a full-length film around an egg was wonderfully solved by the popular musical team of Rainger and Robin who suggested that rather than fight over an egg, the two kingdoms could fight over a song. 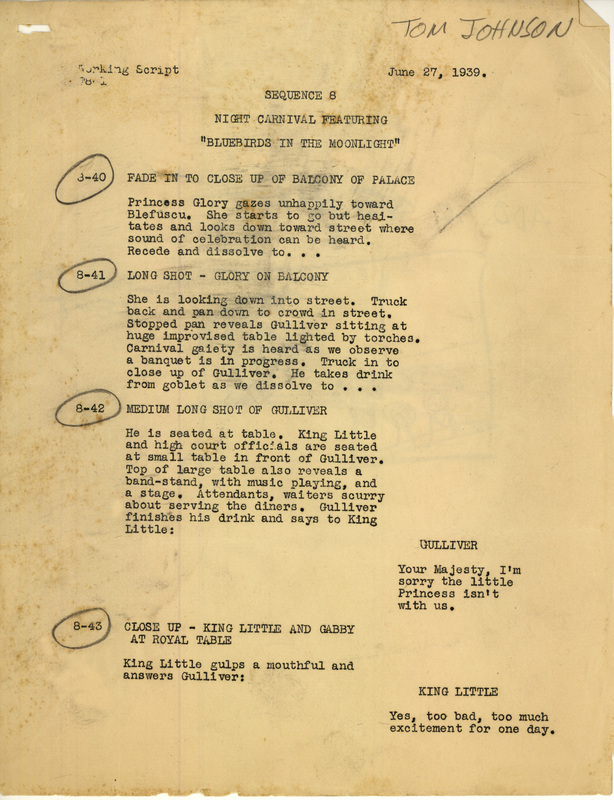 Having identified the film’s main conflict, the studio developed about 50 different versions of the script before settling on the final one, in which the Lilliputians are preparing for the wedding of Princess Glory to her true love, Prince David, from the neighboring kingdom of Blefuscu. All is well until one king wants to play the song Forever at the wedding and the other insists on the song Faithful. The musical solution, devised by Rainger and Robin, (just two of the many composers and lyricists who contributed to the film’s score), not only provided a beautiful resolution to the film’s central conflict, it also garnered the two an Academy Award nomination for Best Original Song. Interestingly, Gulliver’s only other Oscar nomination was also for music. Victor Young, who composed the film’s atmospheric music, was nominated for an Academy Award for Best Music, Original Score. But perhaps even more interestingly, the song for which the film is most remembered, It’s a Hap-Hap-Happy Day, wasn’t written by any of these men. It was written by Sammy Timberg, Al Neiburg and Win Sharples. 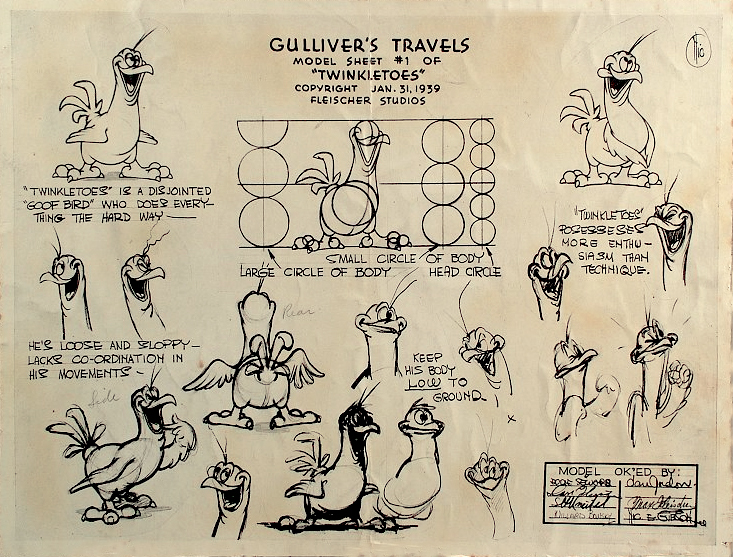 Once they had a script, there was still the question of how to animate the character of Gulliver. The studio explored numerous options including casting Popeye in the role of Gulliver, or even combining a live-action Gulliver with animated Lilliputians (possible Gullivers included Bing Crosby and Gary Cooper.) Ultimately they decided to film a live actor, using Max’s invention of the ‘Rotoscope’ to create a more realistic-looking, but still animated, Gulliver. At 78 minutes long, Gulliver’s Travels was by far the longest, most complex, most expensive project they’d ever taken on. The Fleischers estimated they would need a staff of about 700 to complete the project, yet their current staff -- of just 200 -- was already cramped in their current New York Times Square studio location. If they were going to complete their work on schedule, they would have to nearly triple the size of their staff and their space… and needed to do it fast. The solution – as madcap as it sounds – was to move the whole studio, its equipment, its staff, and their families to Florida! Miami, which was mainly a summer destination at the time, was eager to boost its year-round appeal and its economy by attracting film studios. As a locale, it offered an East Coast version of everything California had: great weather, lots of space, willing workers and even cheaper land. Best of all the city, anxious to make itself the home of a major studio, made the move financially viable and a very attractive solution for the Studio. Max designed a new, state of the art, animation studio in Miami. Located in a neglected and undeveloped area near the Seminole Indian Reservation (a local tourist attraction), it was one of the first completely air-conditioned office buildings in Miami. ‘Semi-Final Footage Totals’ is interesting since it shows which animators worked on specific scenes. Fleischer Family Collection. 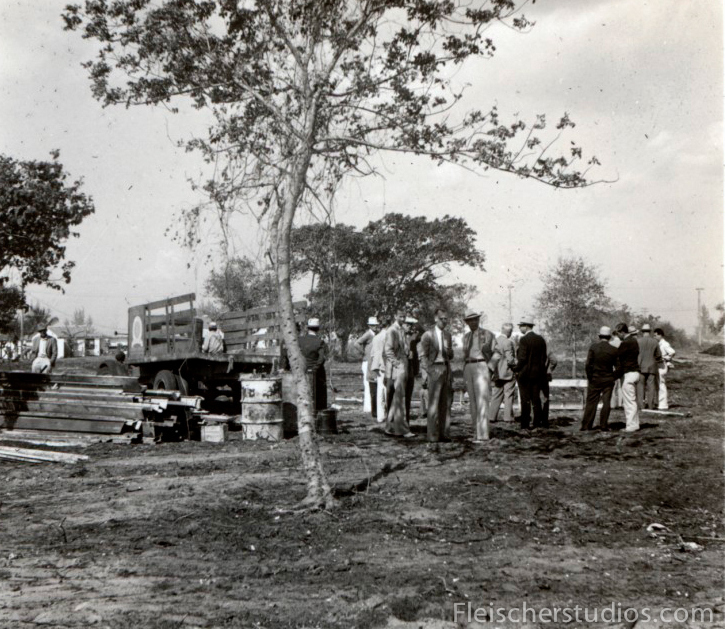 Fleischer staff attend ground-breaking for the new Florida Studio, March 1939. Fleischer Family Collection. 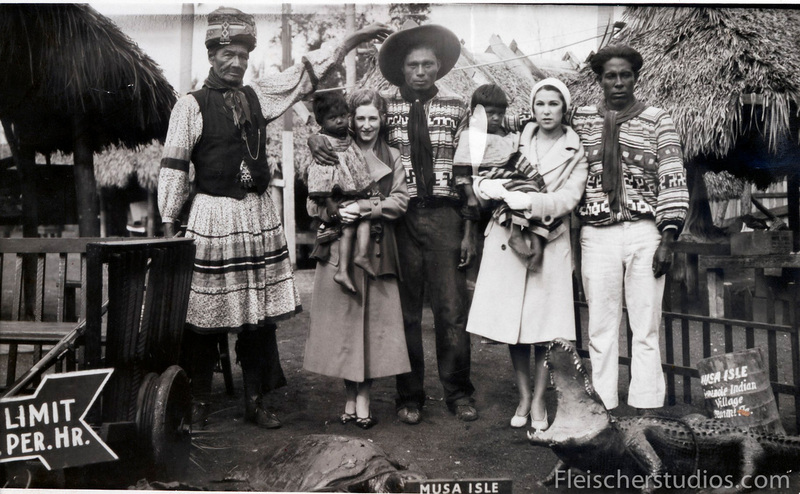 Ruth Kneitel (center), Max Fleischer's daughter, visiting the Seminole Indian Village only a few blocks from the Florida studio. Fleischer Family Collection. Work began on Gulliver in May 1938 at the Fleischers’ New York studio home. 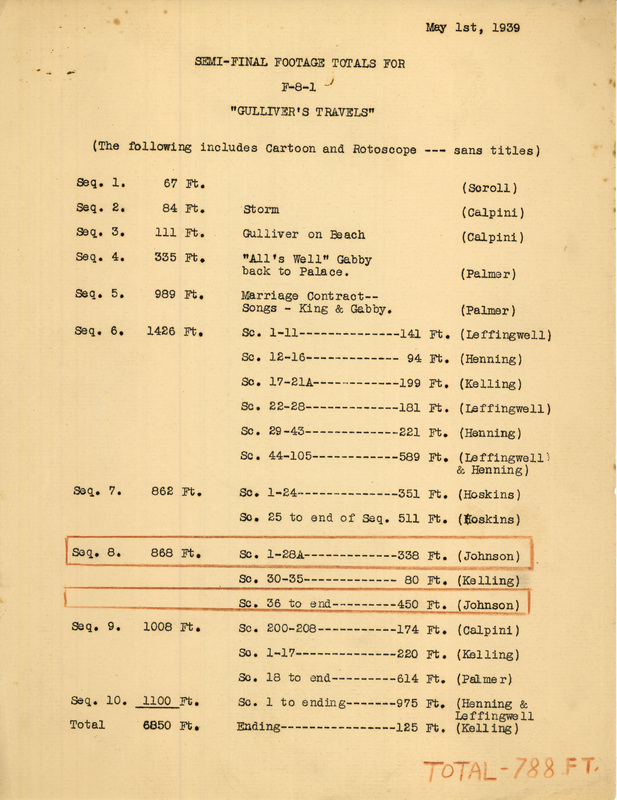 Just five months later, in September 1938 and while construction on the Miami studio was still ongoing, staff - and their families - began making their way to Florida. 200 staffers made the move from New York with another 100 hired from California (some of whom had previously worked for Fleischer Studios). The studio turned to the Miami Art School, where Fleischer artists began teaching classes in skills related to animation, for the rest of their staffing needs. For all the benefits Miami offered, there were complications as well. Because Miami had no support services for a film industry, every piece of film they shot had to be sent to Los Angeles or New York to be processed, and any equipment breakdowns had to be serviced in Atlanta more than 600 miles away. Despite all the challenges it faced, Fleischer Studios managed to meet its delivery date. Gulliver’s Travels opened, as scheduled, in December 1939, making it the second full-length animated feature ever. It was such a success that the Fleischers immediately began work on their next full-length feature, Mr. Bug Goes to Town. Due to its lengthy and extensive theatrical release, its many showings on television and its public domain status, some historians believe Gulliver’s Travels has been more widely seen than Snow White and the Seven Dwarfs. With the advent of TV, the 78-minute film was often cut to fit a traditional 60-minute time slot (including room for commercials, of course). The combination of these factors has led to such a glut of poor-quality, highly edited copies of the film that it is now very difficult to find a high quality, uncut copy of the film. In celebration of the film’s seventy-fifth anniversary, Thunderbean has released a wonderfully restored and fully intact edition of Gulliver’s Travels, including many fascinating extras. For a short preview click here. If you're interested in reading Gulliver's Travels, Project Guttenberg offers a free e-copy of it here. Check out these amazing drawings by some of the animators who worked on Gulliver's Travels! 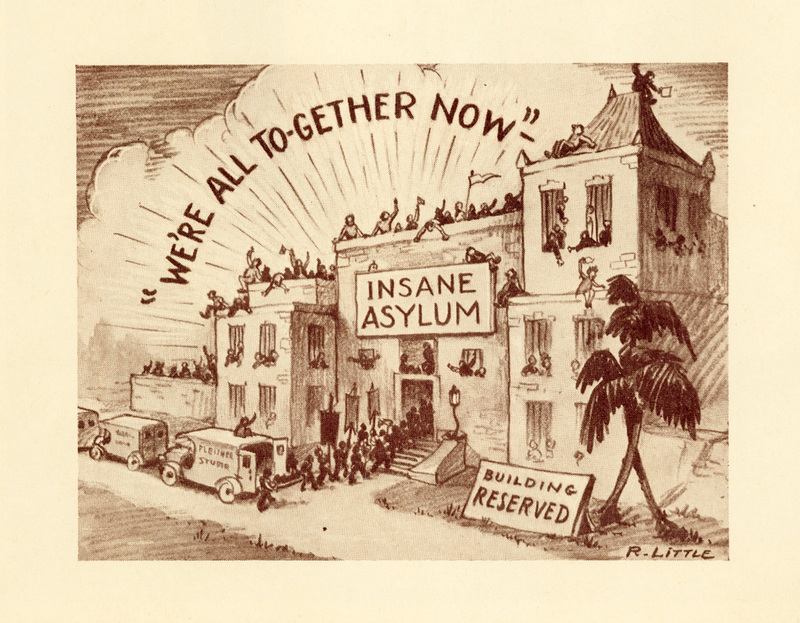 These comic sketches were a part of an annual booklet created for the studio's 1939 Holiday Party. 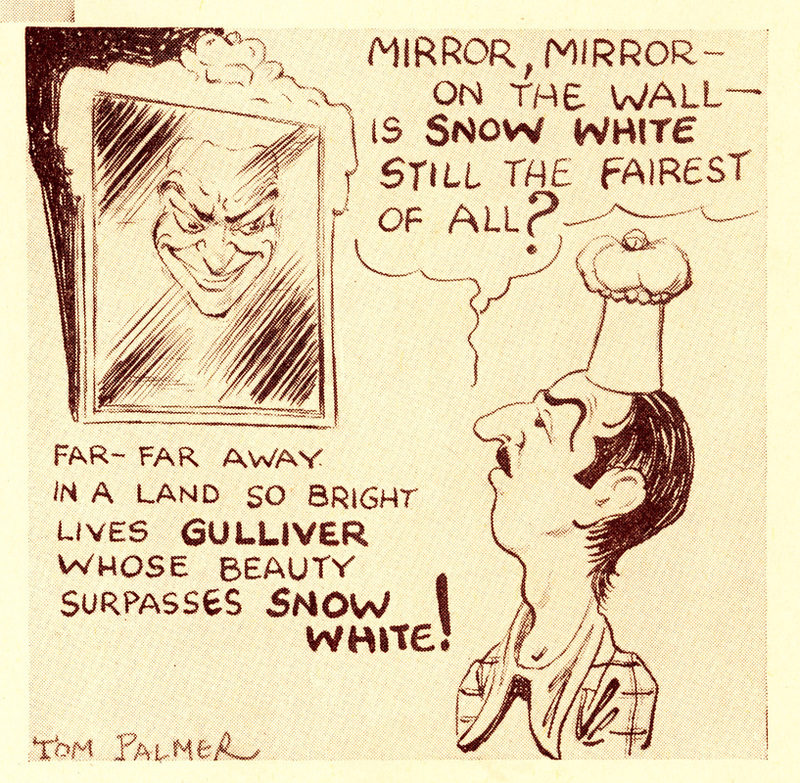 Animator Tom Palmer tries the Snow White mirror trick. Fleischer Family Collection. 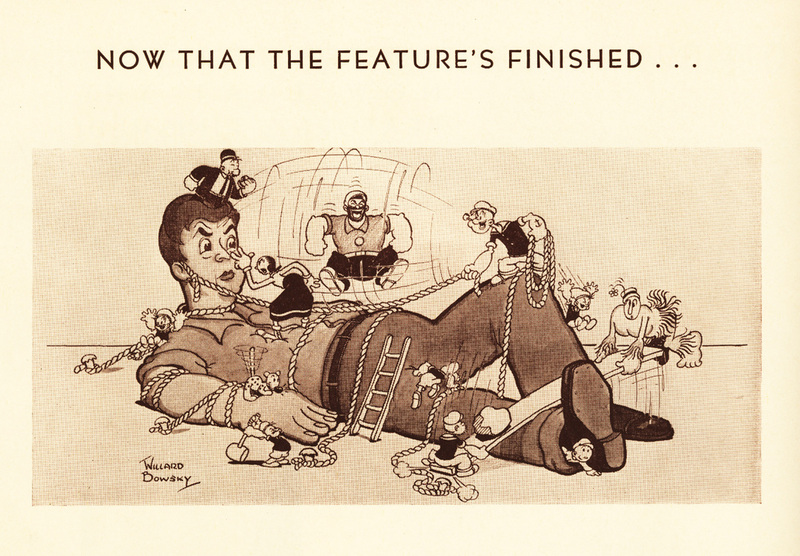 Another look at life after Gulliver by long time Fleischer Animator Roland (‘Doc’) Crandall. Fleischer Family Collection. 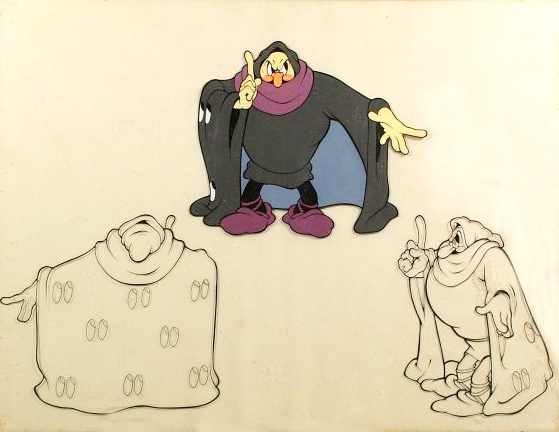 Gulliver meets some other Fleischer characters in this drawing by animator Willard Bowsky. Fleischer Family Collection. 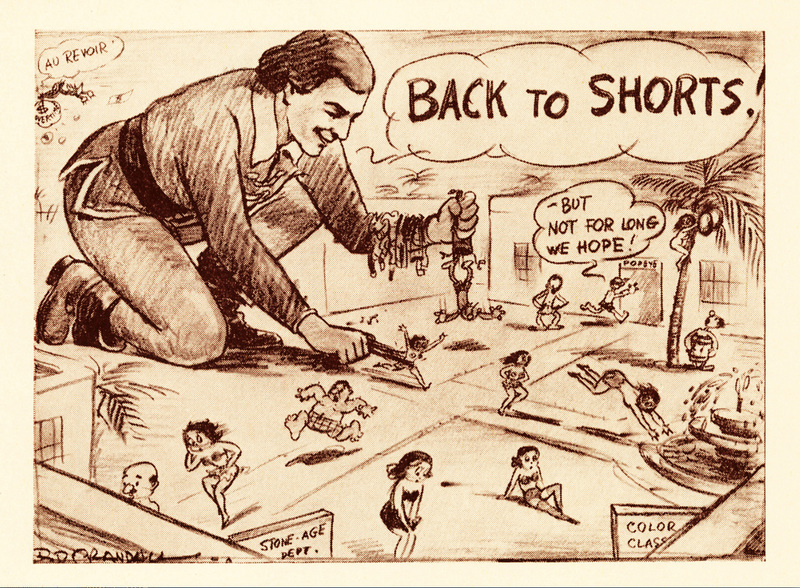 Fleischer background artist Bob Little’s view of life after Gulliver. Fleischer Family Collection.